Shortly before his beheading, Louis XIV is said to have asked for news from La Pérouse, the explorer whom he had sent on a famous expedition around the world, and who had gone missing the year before. It remains unclear who died first, the king in Paris or La Pérouse in the southwest Pacific, and we have no news on this matter. But northeast of La Réunion, a very large seamount is named after La Pérouse. Satellites have long detected it thanks to its strong gravity signal, but during last year’s cruise, we were the first to map a fringe of it with high-resolution bathymetry. These are directed arrays of sound wave pings that the Meteor sends to the seafloor every 10 seconds, to map out its depth several kilometers to the left and right of the ship. This year we returned, and did two perpendicular passes across La Pérouse. The first pass showed that it is flat-topped: a so-called guyot, probably topped and rimmed by drowned coral reefs – the first piece of news about La Pérouse. 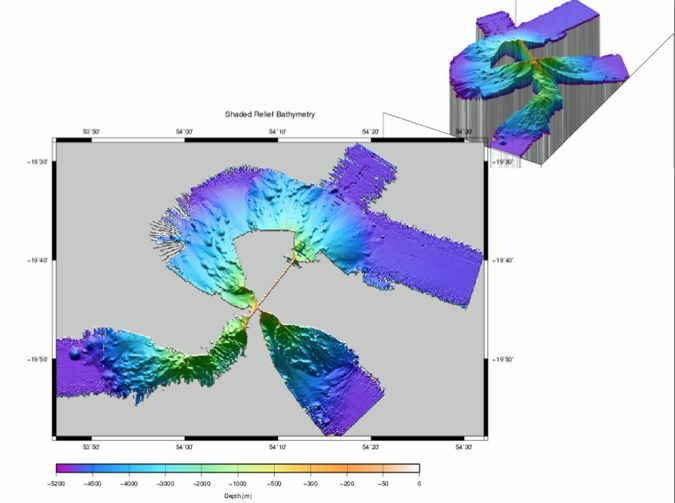 When we returned, the bathymetry in addition revealed huge submarine landslides along the flanks of the seamount. On the bridge, it was amusing to watch colleagues excitedly crying “Only 60 meters deep! 55 meters!”, leaning over the railing to see if the shallow water would change color. Whereas the Meteor’s captain, watching his nautical chart made from low-resolution satellite data, was grumbling “It should be 2000 meters here…it should be 1500 meters…” In view of such large uncertainties about the seafloor, a point of practical importance occurs: the seamount’s corals did not rise quite as close to the surface as the reef that spelled the end of La Pérouse’s expedition 225 years ago.